Forecasts of showers and the potential for thunderstorms at the Kennedy Space Center could delay the landing of the space shuttle Atlantis on Friday morning. Atlantis astronauts are checking their flight systems and packing up following their successful mission to repair the Hubble Space Telescope and in anticipation of a Friday landing. But with the weather forecast gloomy, the seven-person crew has begun to conserve power on the shuttle in case they need to remain in orbit above the Earth until Monday. NASA said the first two potential landing times for Friday are at 10 a.m. ET and 11:39 a.m. ET. Showers are expected during that time, but the forecast gets worse later in the afternoon, with thunderstorms predicted. NASA has the option of landing shuttles at other landing sites — most notably Edwards Air Force Base in California — but the preferred landing site is Kennedy because it makes it easier for NASA crews to put the shuttle back in its hangar. The shuttle has been cleared for re-entry after a Thursday inspection of the shuttle's wings and nose showed no evidence of damage that might give NASA additional concerns about Atlantis's return to Earth. 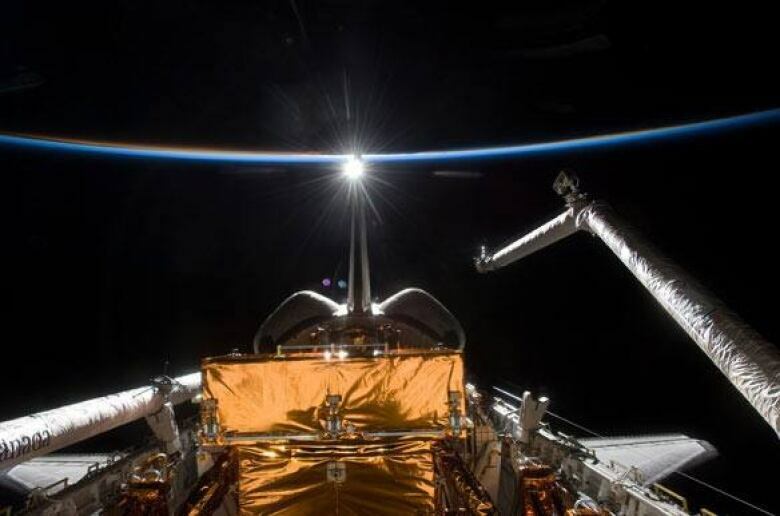 Atlantis flew to Hubble last week on a mission to give the 19-year-old orbiting telescope its fifth and final repair. The seven-person crew needed five spacewalks to replace the telescope's batteries, gyroscopes and data handling unit and add a host of new instruments. NASA hopes the repairs will keep Hubble running for another five to 10 years, giving astronomers further opportunity to use it to peer into deep space and work on unravelling some of the bigger mysteries of the universe.